The secret sauce recipe of Telapush light installations. Python uses a Global Interpreter Lock to make sure that memory shared between threads isn’t corrupted. This is a design choice of the language that has it’s pros and cons. One of these cons is that in multi-threaded applications where at least one thread applies a large load to the CPU, all other threads will slow down as well. For multi-threaded Python applications that are at least somewhat time-sensitive, you should use Processes over Threads. I wrote a simple python script to show this phenomenon. Let’s take a look. The core is this increment function. It takes in a Value and then sets it over and over, increment each loop, until the running_flag is set to false. The value of count_value is what is graphed later on, and is the measure of how fast things are going. Like increment, load is the target of a thread or process. The z variable quickly becomes large and computing the loop becomes difficult quickly. The rest of the code is just a way to have different combinations of increment and load running at the same time for varying amounts of time. The graph really tells the story. Without the load thread running, the process and thread versions of increment run at essentially the same rate. 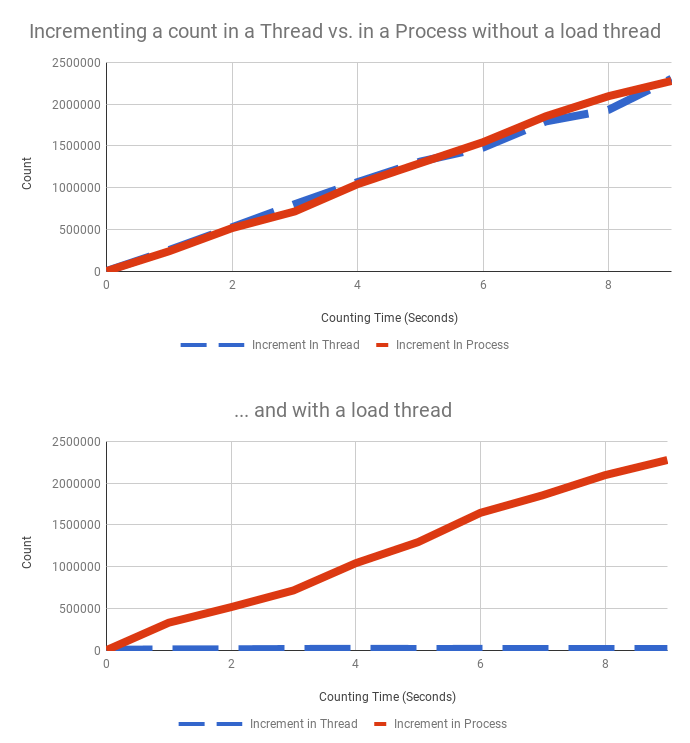 When the load thread is running, increment in a thread grinds to a halt compared to the process which is unaffected. That’s all! I’ve pasted the full source below so you can try the experiment yourself. s += str(count) + " "
Hey! This post was written by Devon Bray, Co-Founder at Telapush. It was originally posted on his blog which you can check out here.